DP-Accessories has teamed up Gorilla Automotive Products to set new standards in lug nut design and construction. Gorilla Automotive Products has engineered these lug nuts to surpass the highest OEM (Original Equipment Manufactured) quality standards. Their lengthy quality control process combined with extensive testing ensures that you will receive a durable, long lasting lug nut. Take a close look. Because these are absolutely the finest "one piece" lug nuts ever made and designed for those that demand the very best. 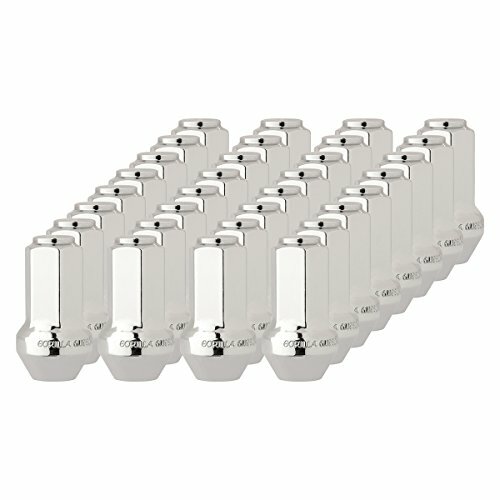 These solid one piece lug nuts are designed to fit factory aluminum wheels on many Ford Trucks/SUVs (2001-2014) and Lincoln Trucks/SUVs (2003-2012). They are a direct replacement for Ford Motor Company factory part numbers 4L3Z-1012-A and 7L1Z1012A. They also replace Dorman part numbers 611-288, 611-288.1 and 9-100042.1. Backed by a manufacturer warranty against rust and defects of workmanship and materials for a period of one year from the date of shipment. FITS: The factory aluminum wheels on many Ford Trucks/SUVs (2001-2014) and Lincoln Trucks/SUVs (2003-2012). Use the vehicle compatibility chart on this page to verify fitment. REPLACES: Ford Motor Company factory part numbers 4L3Z-1012-A and 7L1Z1012A. Also replaces Dorman part numbers 611-288 611-288.1 and 9-100042.1. FEATURES: A solid one piece construction with triple nickel chrome plating to prevent rust and corrosion. Manufactured with heat treated steel for protection against rust and corrosion. INCLUDES: 32 chrome OEM style lug nuts for many Ford/Lincoln trucks and SUVs with factory aluminum wheels shipped in our in our signature premium packaging. If you have any questions about this product by DPAccessories, contact us by completing and submitting the form below. If you are looking for a specif part number, please include it with your message.